Tiger Woods looks on from the second green during the final round of The Players Championship held at The Players Stadium course at TPC Sawgrass in Ponte Vedra Beach, Florida. PONTE VEDRA BEACH, Fla. - Tiger Woods withdrew from The Players Championship on Sunday with an injury that he fears might be a bulging disk in his upper back. “I’ve been playing with a bad neck for about a month,” Woods said. After hitting his drive well to the right on the seventh hole, Woods called for an official. He hit his second shot and grimaced, then walked to the middle of the fairway to shake hands with playing partner Jason Bohn before leaving on a golf cart. Woods had his head bowed for several minutes as he sat in front of his locker, and other times kept his eyes closed as if he were in the middle of a nap before answering questions from three reporters. At one point, he slammed his golf shoe to the ground. He said he first felt the injury before the Masters and plans to have an MRI next week. He said he was having a hard time with the pain, and that there was a tingling sensation on his right side down to his fingers. As he was driven off in a golf cart, Woods continuing squeezed his right hand and released his fingers. “I might have a bulging disk,” he said. By withdrawing in the middle of the round, Woods no longer is eligible for the Vardon Trophy, awarded each year for the lowest adjusted scoring average on the PGA Tour. He has won the award eight times. Woods left the locker room and headed to a physical therapy trailer. He spent 37 minutes inside, then got whisked away from the course in a black SUV. It is the first time he has withdrawn from a tournament since the Nissan Open at Riviera in 2006, when he narrowly made the cut and withdrew from the final two rounds because of the flu. He also withdrew from the 1995 U.S. Open at Shinnecock Hills has a 19-year-old amateur because of a wrist injury from hitting out of deep rough. Woods at times stretched and rolled his neck between shots over the last three days, when he produced some good golf along with some shots that didn’t remotely resemble the No. 1 player in the world. He popped up two tee shots with his 3-wood, and hit another one at a 45-degree angle. 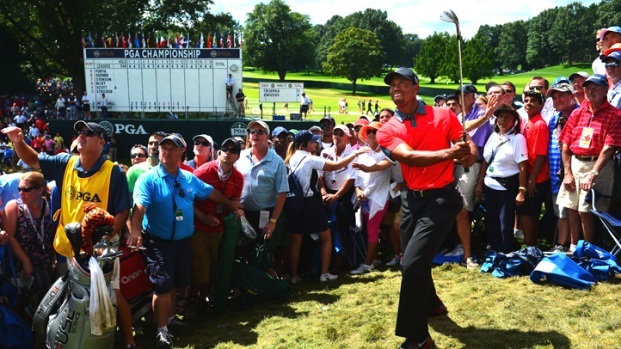 In relatively easy scoring conditions, Woods had rounds of 70-71-71 and was tied for 45th going into the last round. He left as the No. 1 player in the world. Whether he stays there depends on Phil Mickelson, who teed off later Sunday and had to win the tournament to reach No. 1 for the first time in his career.